Go buy garlic at a local nursery- you don’t want to plant the garlic that you buy at the grocery store. This year I planted two varieties of soft neck garlic, Italian Late and Western Rose. Add organic compost to your planting bed- chicken manure is a great bet. The garlic comes in heads, just like you’d buy at the grocery store for cooking. You split up the head into individual cloves and each clove will grow into a new head of garlic. 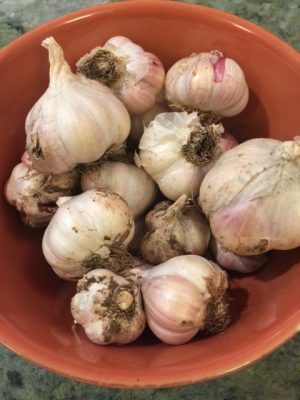 Plant the garlic, pointy side up, 4 to 6 inches apart, cover with 1-2″ of soil. Water in and wish it luck over the winter! Pick a pot of carrots… and plant a pot of greens.